According to comScore, there was a spike in traffic to tax sites from late January to mid-February as early filers file their tax returns. Some 29 million users visited tax sites in February. The peak was the week ending February 6th, when 14 million users visited tax sites. Early filers are outnumbered by late ones, who represent the second major spike in traffic to tax sites. In 2004, 1.9 million users visited irs.gov on April 15th. In 2005, that number hit 2.15 million users. According to the IRS, electronically filed returns have increased, led by a big increase in home computer use. Through early March, more than 39.5 million taxpayers have e-filed this year. Home computer use is up 16.5 percent, with e-file by tax professionals up nearly 4 percent. Out of 54 million tax returns filed so far this year, e-file represents 73 percent of the total returns. By comparison, 72 percent of returns were filed electronically for the comparable period last year. Led by the belief that tax returns e-filing is of major importance for the US tax payers, WebSitePulse is monitoring twelve of the most popular tax websites for the 2006 Tax season. The measurement results reflect the performance levels and the availability of the websites related to the increased Internet traffic during the period. This information is helpful to analyze the End Users' experience, the reliability of the IT infrastructure of the Tax websites, as well as their estimated losses in case of downtime and unavailability of critical web pages, web systems, network devices, and web applications. Continuous monitoring for all websites covers the period March 31 through April 17, 2006. The reports and charts are updated daily showing the results from the previous day and for the entire monitoring period to the current date. 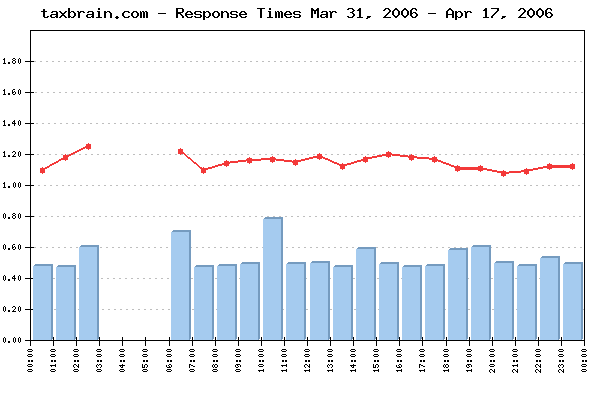 The daily Average Response time from all monitored websites was 1.114 sec. The Average Response time as measured from the US East Coast (Washington, DC) was: 1.149 sec. The Average Response time as measured from the US West Coast (San Francisco, CA) was: 1.148 sec. 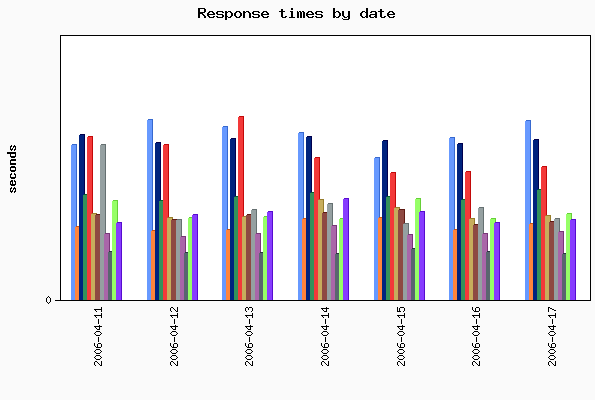 The Average Response time as measured from US Central (Chicago, IL) was: 1.046 sec. The Best Response time measured from the US East Coast was: 0.423 sec. The Best Response time measured from the US West Coast was: 0.198 sec. The Best Response time measured from the US Central was: 0.608 sec. 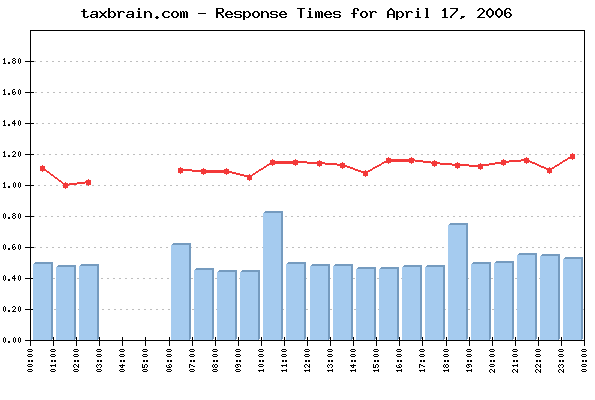 The typical e-filing transaction took the least time for taxbrain.com visitors - 0.517 sec., while the Customers of irs.gov had to be the most patient, as the transaction there took in average of 2.029 sec. Four of the monitored websites delivered above-the-average response times for their e-business-critical web pages, while eight of them demonstrated below-the-average daily performance. 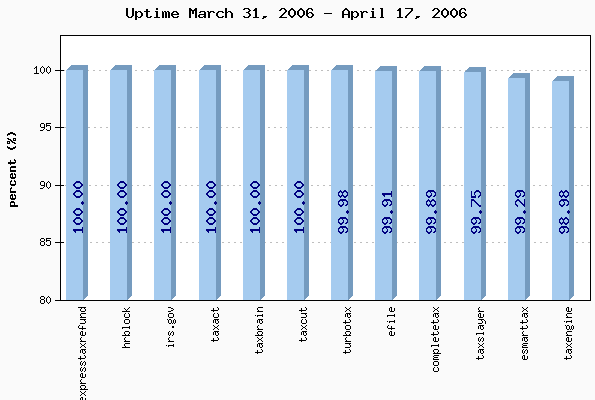 The daily average uptime for the entire Group was 99.93%. Eleven websites were available with no interruptions - 100%. Eleven websites' availability was above the average, while one online retailers dragged the average down with below-the-average availability. No events of particular importance or possible negative impact on the tax returns e-filing process were detected during the reported period, and according to WebSitePulse, the Group delivered the expected levels of End-User experience and Customer satisfaction. The steps in each transaction are comparable for all websites, and reflect the real online buyers' experience. The simultaneous monitoring is performed from 3 US locations of the WebSitePulse monitoring network: Chicago, IL; San Francisco, CA, and Washington, DC. In case of a detected malfunction or unavailability, the system performs automated error verification from 3 independent resources before it is confirmed, recorded and included in the daily performance reports.